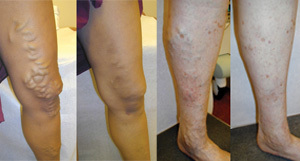 Erase varicose veins pain with VenaCure EVLT™. If you’re one of the more than 25 million Americans who suffer from uncomfortable and unsightly varicose veins, you should know about a non-surgical treatment that’s safe, virtually painless, and requires little to no downtime. The VenaCure EVLT™ laser vein treatment procedure uses laser energy to achieve proven results without the discomfort and lengthy recovery experienced through the surgical option of ligation and vein stripping. 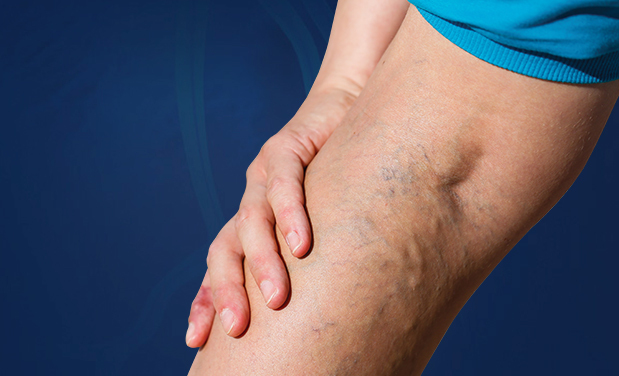 Varicose veins can develop through a combination of weakened vein walls and faulty valves. Under a variety of circumstances, normally toned, elastic vein walls can become weak and allow the recirculating blood that should be moving toward your heart to flow backward. One-way valves in these veins—which open and enable blood to flow through on its way upward, then close to stop blood from flowing backward—can also fail to function properly. This allows blood to pool and pressure to build up, which further weakens and subsequently damages the veins, causing them to become twisted, enlarged, and painful. Up to 40% of women and 25% of men are affected by this condition—and fortunately, treatment is available. Simply put, a laser is a highly concentrated beam of light. Medical lasers work by delivering this light energy to the targeted tissue with extreme precision, so as not to affect the surrounding tissue. In laser vein treatment, a thin fiber is inserted into the damaged vein. A laser light is emitted through the fiber, delivering just the right amount of energy. The targeted tissue reacts with the light energy, causing the vein to close and seal shut. The veins that are closed off are superficial veins that handle less than 5% of your blood flow. The blood is automatically routed to other veins. 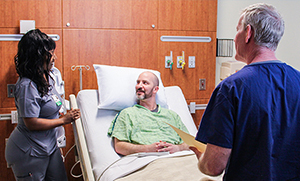 The entire VenaCure EVLT™ procedure typically lasts anywhere from 45 minutes to one hour and requires only a local anesthetic. The surgeon will insert a thin laser fiber into the vein through a very small entry point, and the laser light that emits through this fiber will seal the faulty vein. While you might feel an unfamiliar sensation, it is not painful. This part of the procedure takes literally just a few minutes. You will be encouraged to walk immediately after the procedure, and you can resume normal activity the same day. (Ask the surgeon when it is safe to resume rigorous activities.) Some patients may experience temporary soreness, which can be treated effectively with over-the-counter, non-aspirin pain relievers and should subside within the first five days. After treatment, the appearance of the abnormal vein is instantly improved with minimal scarring. There may be some slight swelling and minimal bruising around the treatment site. However, once that subsides, you will see a significant difference in the appearance of your legs. For those patients who don’t experience these small side effects, the results are obvious right away. If you’d like to find out if you’re a candidate for laser vein treatment of varicose veins, please call (618) 257-VEIN (8346).